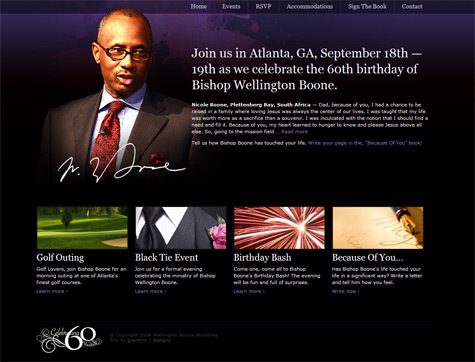 Recently completed a project for my pastor and close mentor, Bishop Wellington Boone’s 60th Birthday Celebration. Of course, Expression Engine was the CMS of choice and I inserted jQuery a bit in this project. Also, I took the photo of him featured on the home page sometime last year. I think it was in October 2007. Everything else came from istock or some pro photos a guy took some years back. Love your work. Didn’t know you did expression engine. I may have to higher you on some future projects. Yep. Just been too busy to upgrade this site to EE. Hopefully I’ll get around to it by the end of the year. I love the violett gradient in the header, it’s beautiful.